Growing up in Thailand, grilling out with the family during the summer was not something Dom did as a kiddo or adult. In Thailand, if you want something grilled, you just walk out your door, and sniff out a street vendor nearby grilling something spicy, and mouth-watering, and buy it. Why grill it yourself when it’s so cheap and delicious to just buy it on the street? But in America, sadly Thai street vendors don’t exist here, and since we love grilled food, my Thai hubby has had to learn the art of grilling on his own. Last year I got my Bon Appetit magazine in July, and Dom saw the cover glistening with spicy grilled chicken kebabs. He requested it for his birthday, and he grilled it for us in August on his birthday, and it was good. But this week we decided to try them again since we’ve had perfect sunny grilling weather, and it was AWESOME! I think the big difference is this time I marinated them for a few hours before we grilled them, and then I let the marinade simmer down more on the stove so it was thicker and made the kebabs more flavorful. And we also made some tweaks to the recipe, making it sweeter and adding more ginger…and Dom’s learned more about grilling since last year. 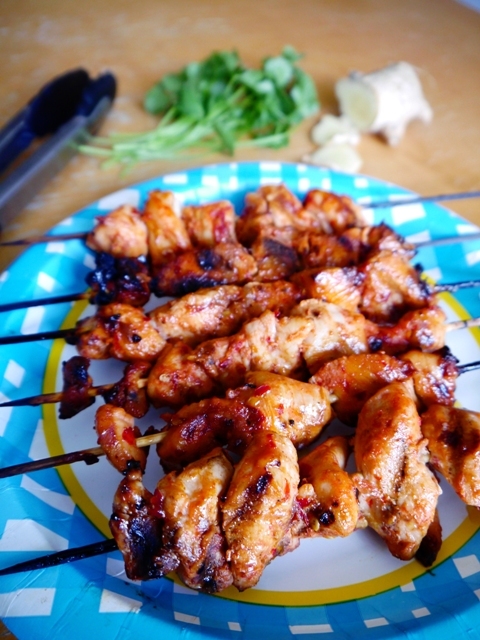 But we are still learning, so if you have any grilling tips to pass on, let us know, and we hope you enjoy these Sriracha Ginger Grilled Chicken Kebabs as much as we did! In the mood for spicy, sweet, grilled chicken kebabs? 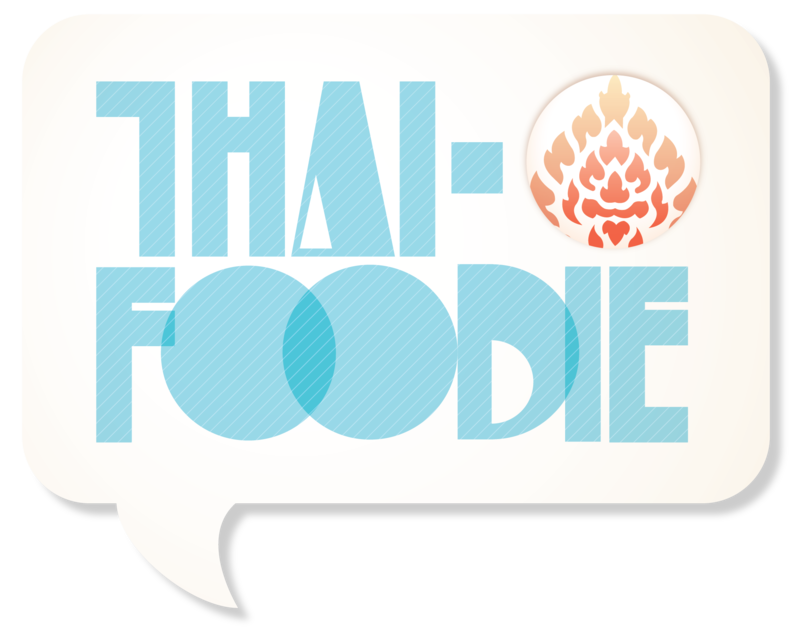 Try our Sriracha Ginger Grilled Chicken Kebabs today! Whisk brown sugar, vinegar, Sambal chili paste, fish sauce, Sriracha, and ginger in a large bowl. Add chicken and mix. Let marinate for at least 2 hours. *If you don't have time to marinate, it will still turn out fine, but we liked the way it tasted better marinated. 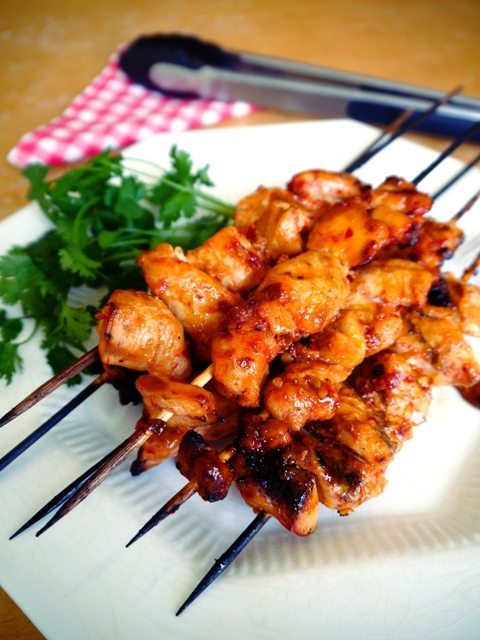 Thread 4 or 5 chicken pieces onto each skewer. Transfer marinade to a small saucepan. Bring to a boil, reduce heat, and simmer for around 7-10 minutes until the marinade is reduced by half, and has thickened. Grill chicken, turning and basting often with marinade until cooked through for about 8–10 minutes. We like to eat this with rice or noodle salads with cilantro!